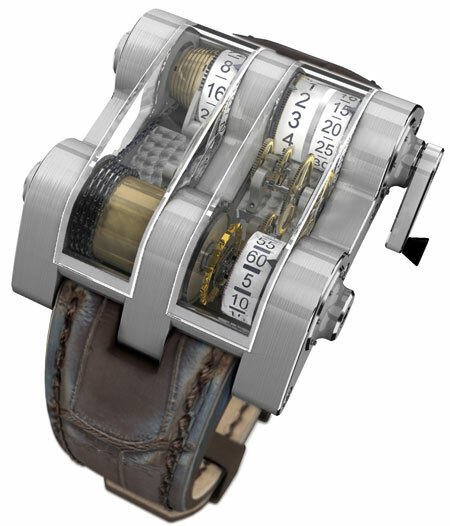 The Cabestan, A $220,000 Watch | OhGizmo! In completely out of my depth on this one. I know next to nothing about watches that cost more than a couple of hundred dollars. This one, The Cabestan, costs a couple of hundred… thousand. $220,000 to be exact. I’m sure there are a bunch of perfectly valid (at least in the minds of the people selling these) reasons for the price tag. I’m not sure any of these have anything to do with the materials used or the technology involved. Perhaps it has to do with the 135-piece limited edition, or the convergence of two big names in the watch world (Jean-François Ruchonnet and Vianney Halter)… What do I know? Perhaps it’s just a marketing gimmick. I mean, think about it. A $220,000 watch! You’re gonna wanna tell people about it. No? Here you have a 260K IWC. Minute Repeater by Ulysse Nardin is a bit cheaper, 210K.